When Martin Scorsese's filmography is explored, there are typically two efforts that define his oeuvre: 1976's "Taxi Driver" and 1980's "Raging Bull." However, during this fertile creative period there was another picture, sandwiched in-between, a 1977 feature that effectively stalled and oddly reenergized Scorsese's career. "New York, New York" isn't a forgotten or lost picture, but one that's rarely brought up when a discussion of the maestro is introduced. A shame, really. While it's flawed and fattened, it's one of Scorsese's more appealing experiments, looking to resuscitate the traditional Hollywood musical within the raw mood of the 1970s, creating an unusually frosty, but pleasingly unpredictable candy-coated psychodrama. 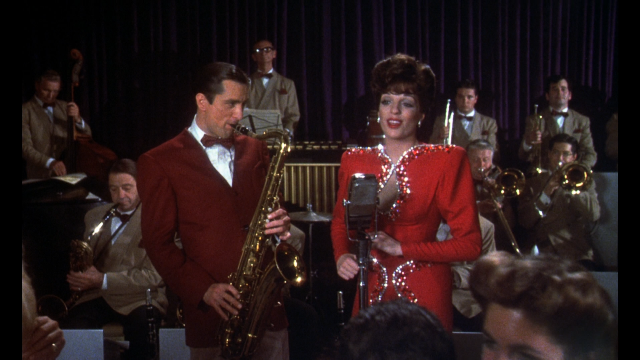 It's the end of WWII and saxophone player Jimmy Doyle (Robert De Niro) is looking for a good time, stepping into the path of USO singer Francine Evans (Liza Minnelli), who is skilled at refusing his advances. A frightfully determined man, Jimmy pursues Francine until he breaks her spirit, with the couple embarking on a musical career, facing bookers more interested in her voice than his jazz-influenced musicianship and red-hot temper. Struggling to make a name for himself, Jimmy's destructive ways take their toll on Francine, whose passive nature and eventual pregnancy keep her pinned down, allowing her husband further control. As the years pass, the two struggle to define their union, leaving Jimmy and Francine to wonder if they're better off apart. It's always a treat to find a director interested in paying tribute to the seminal motion pictures of his cinematic education, with Scorsese perhaps the finest student around. "New York, New York" is patterned off the glorious Technicolor achievements of the 1940s and '50s, most notably the work of Vincente Minnelli -- an influence so charged, the filmmaker employs the man's daughter as his star. 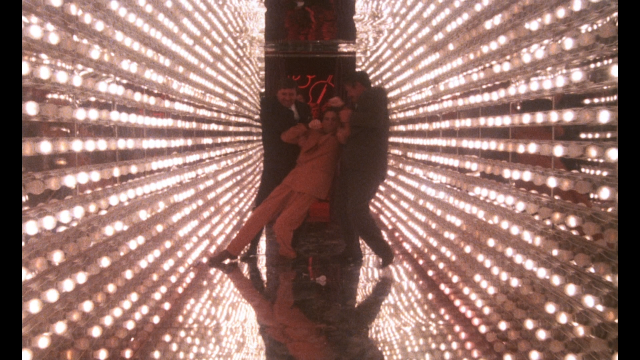 In love with an era of big colors, cavernous sets, and squeezed emotions, Scorsese orchestrates a thrilling return to simplicity and glamour, designing a bold picture of artifice and nostalgia, creating his own sandbox of old Hollywood delights. It's a stagebound valentine, but one vigorously constructed down to the last detail, with Scorsese reveling in the costumes and music. It's an itch that spreads into a full-body rash in the final act. While elaborately decorated and colored, the characterizations of "New York, New York" are rooted firmly in the 1970s, with a hostile tone to Jimmy and Francine's relationship that darkens the light Scorsese is sweating hard to maintain. The screenplay communicates an unease between the couple, presenting Jimmy as a domineering force who won't take no for an answer. The picture isn't a love story, it's a tale of resignation and control, with Francine looking queasy throughout most of the movie, browbeaten into submission by her bullying husband. It's unusual to find a film so utterly consumed with the formula of romance refuse to participate in warm human interaction, but that's part of the feature's askew charm and effort of genre criticism. Scorsese works diligently to make a sensitive story about two people who don't even like each other, boosted by surprising performances from Minnelli and De Niro, who blends a little Bickle into his performance as Jimmy, bravely playing a callous, unromantic figure desperate to find a suitable creative outlet. "New York, New York" eventually reveals itself to be a complex story of behavior, not escapism. 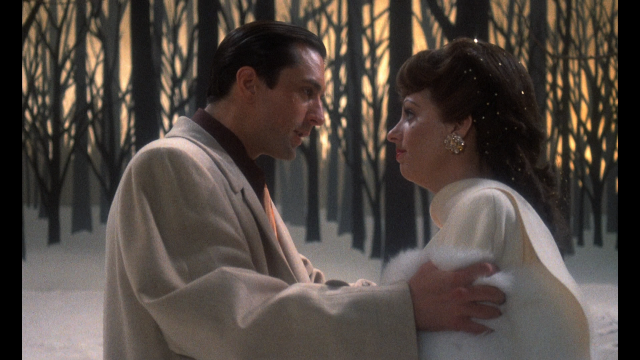 As much as the movie's cinematography suggests broad entertainment, the script keeps to a routine of argument and intimidation, which is difficult to digest over the 160-minute run time, a motion picture length that intermittently morphs into a prison when De Niro and Minnelli chase a few improvisational contests. Still, that gritty feel makes for an interesting commotion, especially with the filmmaker indulging his fantasies any chance his gets, staging massive crowd scenes, musical performances, and ornately lit club gatherings. "New York, New York" is rough, but it's never unconvincing, thanks to such extraordinary directorial authority. 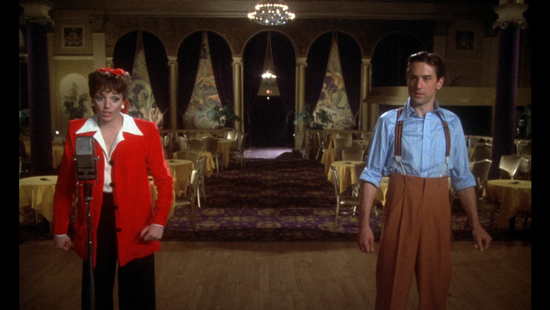 The AVC encoded image (1.66:1 aspect ratio) presentation is a mixed bag, the upside being a glorious representation of the feature's extensive color palette, with reds and blues generating a heightened fantasyland of neon lighting and cherry make-up, while costumes are equally as pronounced, finding period hues with ease. The film's soft cinematography doesn't exactly lend itself to a crisp BD viewing experience, but the image here is detailed and satisfactorily separated. Grain is unwieldy, swarming a few scenes with tremendous intensity, losing the impact of the filmed image at certain intervals. Some minor print damage is detected as well. Shadow detail is commendable, holding costumes and hairstyles for inspection, while skintones look pleasingly pink. The 5.1 DTS-HD sound mix doesn't embellish the natural design of the film too harshly, with dialogue exchanges holding firm in the front, keeping solidly center, with a slightly clouded but comprehensible range of voices. Musical numbers open up the dimension of the track substantially, with a wide feel for instrumentation and vocal performance. The songs creep into surrounds peacefully, generating a circular feel of club interiors. Atmospherics are also detected, with light chatter and city life offering some mild activity. Low-end is light, with most of the mix devoted to the brassy focus of the music, keeping crisp and assured. Spanish and French tracks are also included. The feature-length commentary with journalist Carrie Rickey and director Martin Scorsese is expectedly flush with production information, film history, and backstage worry. Rickey is here to read an essay on the picture, taking an outsider position to explore the creative process, itemizing how the movie was assembled. Scorsese works without a script, burning through his influences and intentions in his charismatic professorial style, generously revealing every inch of motivation that informed the film. The talk is breathless and direct, a master class in the architecture of "New York, New York." A second commentary is offered on select scenes with cinematographer Laszlo Kovacs, who takes a more direct approach, detailing the technical labor and artistic intention of certain shots. "Introduction by Martin Scorsese" (5:36) returns to the director, who condenses his thoughts on the influences and technical achievements of the movie. "Alternate Takes/Deleted Scenes" (19:14) offers an unfinished look at more improvised moments of the film, with the cast gamely working their every instinct to keep scenes alive. There are no substantial dramatic additions, instead sticking to repetitive verbal jousting. "The 'New York, New York' Stories: Part One" (25:31) and "Part Two" (26:58) take a guided path of recollection, using interviews with the crew to dissect the development and execution of the motion picture. Talks with producers Irwin Winkler and Robert Chartoff, cinematographer Laszlo Kovacs, and director Martin Scorsese dominate, excitedly recalling the intensive labor and specific production needs of the film, while also detailing its poor box office performance. "Liza on 'New York, New York'" (22:09) sits down with the star of the show, who examines her history with Vincente Minnelli and her professional fears when it came time to face De Niro and Scorsese. The performer is extremely proud of the picture, which is refreshing. A Teaser Trailer and Theatrical Trailer are included. 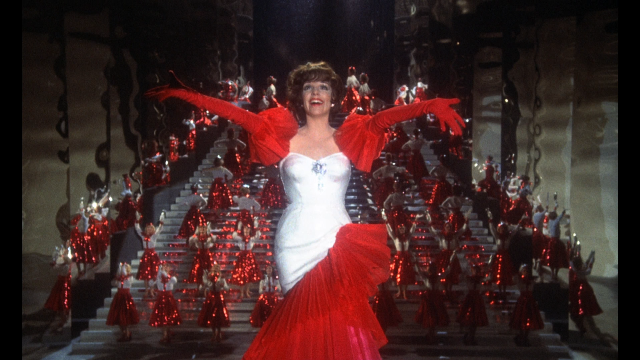 Following Francine as she takes on the bright lights of Hollywood, the final act of "New York, New York" explodes with choreography and color, with Scorsese rabidly staging orgasmic musical numbers teeming with dancers and vast sets, thwacking the image with magic dust as Minnelli soars into song and dance. 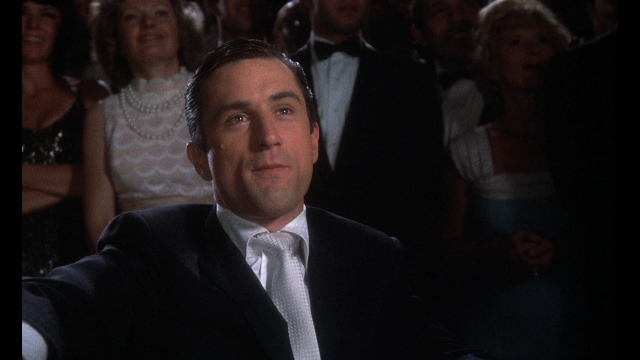 It's a happy place that takes two hours to arrive, but once planted, Scorsese doesn't let the audience down. The full-blown musical recreation is immensely satisfying, though it mucks with the steady psychological rhythm of the picture. It's a jubilant conclusion with bittersweet punctuation, permitting Scorsese to kick up his heels while tending to the central relationship with some refreshing honesty, leaving this strange, but effective enterprise with a lasting hold.